It is hot and humid, but I’m not complaining because I’m surrounded by color everywhere I look. How humid? Well, I have to let my clothes dry out before I can put them in the dirty clothes basket. I’m not spending time weeding, the weeds are on their own when it is this hot. What I am doing is moving shade plants that found themselves in the blazing sun after a huge maple tree came down. The transition is complete, but now I’m having to water a couple of times a day and there are a couple of the smaller ones I may lose. Good thing I always have more plants. I’m also working on converting a tree stump to a permanent fairy house. Feel free to join the rest of my family who think I am nuts and wish I’d get over my fairy house fixation. My husband built me a roof structure so today I painted it before we affix it to the stump tomorrow. As long as the AC keeps running and the ceiling fans keep turning, I’m okay with the heat but the humidity could sure come down a little. Hot days also mean we have a bumper crop of tomatoes, slicers and cherry, cucumbers by the bags full, peppers, and carrots for our resident rabbit, Herbert Menninger. Good eating. When I have to give up being outside because I feel like my brain is frying, I get back to work on my quilting project. All 50 quilt blocks are done, now on to squaring them up and sashing. This entry was posted in Gardening and tagged Cucumbers, Fairy house, Gardening, Gettysburg, Tomatoes, Tree stump. Bookmark the permalink. Welcome to my summer–hot and humid. I wasn’t even sure if you had A/C. Glad to hear you do. Hope the plants thrive in their new spot. We had such perfect, comfortable weather last summer, I almost forgot how smothering the humidity gets this time of year. Phew. It is hard to breathe out there. Like breathing through soup! Our roses are having a field day this year. Usually, they die off, but this year, the pink ones have gone berserk and totally taken over the garden. I’m on your side with the fairy house, can’t wait to see some photos! I think the heat does get to us after awhile, nice that you can retreat indoors to indulge in another passion. Have fun! Stay cool! ( It doesn’t seem that long ago that we were saying ” stay warm”). Can’t wait to see your fairy house! I don’t have one (yet!) but I love them!! Humidity and heat here in the Hudson Valley is brutal….like everywhere else. Seems like I no sooner put hose away when I’m out there watering again. Yet my flowers are absolutely gorgeous this year. Go figure! Impatients, which prefer shade, are thriving in boiling sun! Think if I throw some dollar bills in garden they would multiply and flourish too? Hmmmmmm……. When my grands were younger, we always made fairy houses for the Portsmouth Fairy House Tour. Tour is coming up in a few weeks, grands are teens now, so decided we needed a permanent one that we (or me) could enjoy all year round. 🙂 Now gardening dollar bills? I’m liking that idea. 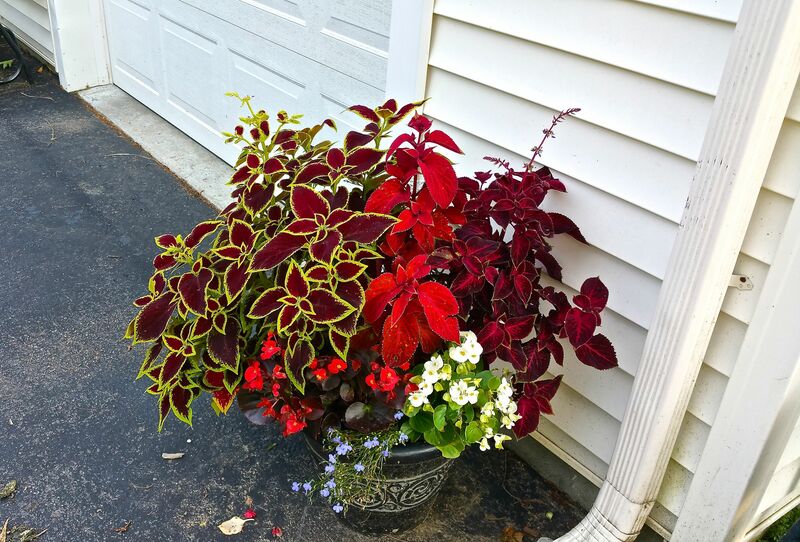 Have you had any problems with Impatiens the last couple of years? I love them but was worried about the fungus. There’s a Portsmouth Fairy House Tour? How did I not know this?? I must admit, the Midwestern humidity is starting to really bother hubby and me. So much so, that we even thought about canceling our time in the UP. But we won’t, since I’ve been looking forward to returning to this part of the country for a while. Plus it could dry out neck week…. fingers crossed. In the mean time, I’ll keep using a machete to slice through the air LOL. I did wear makeup today and it felt like it was running down my face. I was afraid I might’ve looked like I just came from the Circus Museum here in Baraboo, WI…. haha! Wow. You’ve completed FIFTY quilt blocks? Congrats. I’m impressed. I hide from this heat…and gardening! PS, I meant gardening in this heat. I’m a terrible gardener, but I love the result. I stick to perennial bushes and container plants, usually. I love being surrounded by flowers on my patio in the summer. I am hooked on fairy houses now, and I do believe it was you who brought my attention to them several years ago when you posted the tour and showed entries by your grandchildren! Can’t wait to see your permanent one! Your property is so beautiful and so well tended. A place for strolling, gardening and just sitting to enjoy it all. But on some humid days, that sitting and admiring is best done from inside your air conditioned house! Loved this post – living deep activities 😀 i can’t wait to see your fairy tree or your quilt! It’s invigorating to have 2-3 projects going and shuffle between them during the day -especially when heat and humidity can zap our brains. But that sweat running under my shirt has gotta go! We had a few of those 90% humidity days this summer which is highly unusual in Colorado. With temps in the mid-70s at the time, I kept telling Hub I was feeling ocean breezes! I like a nice gin ‘n tonic to cool down when high temp and high humid ! Not a fan of humidity either…but just look at that lush green lawn and those happy trees. We are “green” with envy here in parched California! Me too!! Hopefully it gave you a break from the oppressive humidity! Enjoy your trip to Gettysburg! I took my kids there years ago and even they were impressed! It’s hot and humid in upstate New York, too. Not like it is in so many other parts of the country but enough to make me just want to stay inside and read. But, like you, I have to venture out to water the plants! I’m looking forward to fall! I’m hot and tired after just reading this. My wife did weeding/picking duty in her veggie garden and I don’t know how she did it. That you have energy left after coming back inside is a miracle. I’m looking forward to seeing the Fairy House Judy, I like it when people deal creatively with stumps. It’s hard for me to imagine that you get such hot and humid weather so far north of where I live. Our entire summer is hot and humid here. Luckily we usually have a nice breeze and being outside in the shade is bearable. My weeds always get overlooked during the hottest part of the summer! Love the idea of the Fairy House! Although it cooled off today, it’s been hot and humid here, too. When I go for a walk in the morning, I can feel my hair curling from the humidity, even though it’s only about 7 AM. Your garden sounds delightful. No A/C at the little house in the big woods. Mostly we don’t need it. However, the past few days…I think a fairy house is a wonderful idea. Perhaps some day I’ll construct one of my own. I hope you’ll include pictures when yours is done. 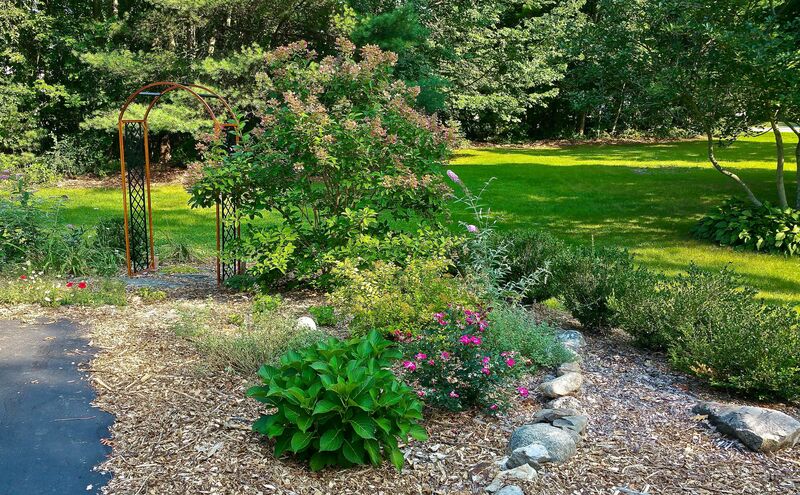 I have mostly shade in the front of my house, and I do worry about whether the huge trees will ever have to come down in my lifetime…Love a shade garden. But you know, sunny spots mean a lot more color, so there is that! I just love the idea of a permanent fairy cottage! Your yard is truly amazing! 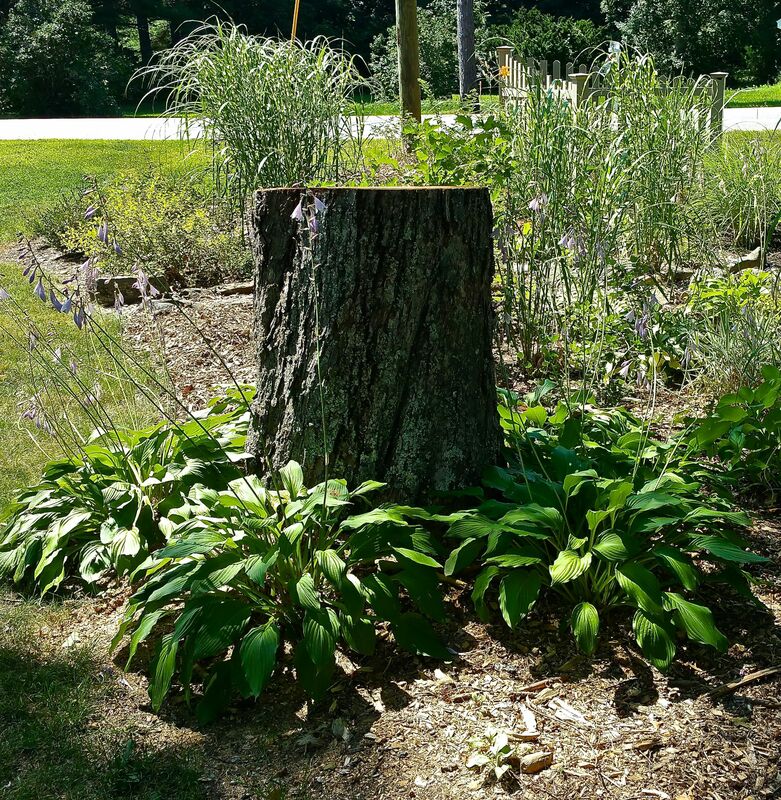 What are the flowers around the tree stump? The leaves remind me of lily of the valley but the flowers are all wrong. What is it? It is a few of my many hosta. 🙂 I’m willing to share. A woodsy fairy house sounds delightful! It’s still hot here, but rarely humid and things are definitely starting to cool down. I hope the same happens out your way soon. A fairy house from a tree stump? That sounds lovely! I can’t wait to see your fairy house finished. I hope you will post some photos. Have a great week-end!